Life has been great for many of us in Singapore. However, there are always fellow Singaporeans some who have difficulty putting food on the table for their family. As part of our CSR (Corporate Social Responsibility) Program, we are fortunate to work together with a group of very dedicated people from SPH “The Straits Times School Pocket Fund” division and enjoy some success through a simple, fun-filling, great learning and meaningful campaign by growing vegetable within the school compound. 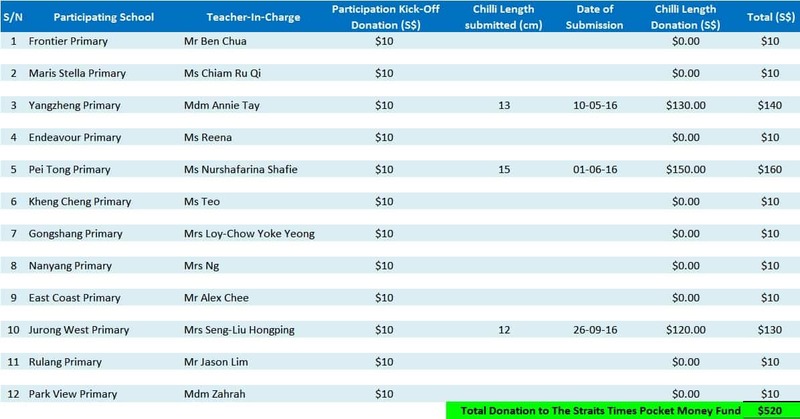 Last year, we managed to raise SGD$920.00 with the participation of 13 schools (Primary & Kindergarten) through the “Inches for Pocket Money 2015” fund raising campaign by planting the Chili Plant. This year, the Chili, a common fruit found in many parts of South-East Asia shall take center stage. Just plant some Chili seeds provided by us with your school children within your school compound to be part of our “Inches for Pocket Money 2016” fund raising campaign! Campaign runs from 1 Jan’16 till 31 Oct’16. Note: The fund-raising runs from 1 Jan ’16 till 31 Oct’16. Participants can send in as many photos as they wish. Only the longest measurement will be considered.